Dealers are expecting this week’s Whitman Baltimore Expo to attract a large audience for several reasons. First, coins from the Saddle Ridge Gold Hoard will be on display hosted by Kagin’s Inc. This is the well-publicized story of buried treasure found in Northern California last year and recently certified by PCGS. 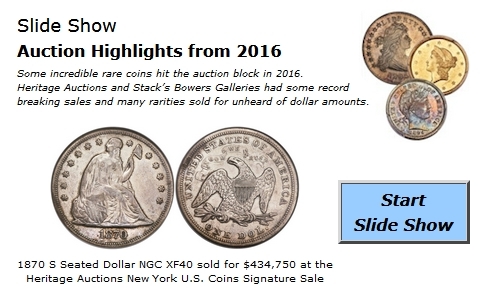 The coin business has seen a large amount of media coverage from all over the country and dealers are receiving lots of phone calls about this major event. For more information about this hoard visit www.saddleridgehoard.com. Next, this major show is routinely one of the best on the East Coast, attracting thousands of collectors from many nearby states. Also, Gold has dropped over $60 in the last week and could help increase sales as buyers take advantage of the lower levels. In addition, Stack’s Bowers Galleries is hosting the official auction of the Whitman Baltimore Expo. There will be numerous rarities in this sale; here are some of the potential highlights. 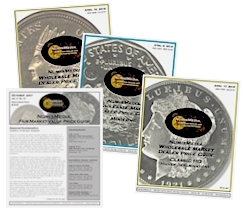 While better date U.S. Gold is still the hottest part of the market, a couple of Modern Platinum coins edged their way near the top of the NumisMedia 500 this week. The 1997 $25 Platinum in MS70 shot up 33.33% for the month to a new high of $2,000 Market. Also on the move is the 1997 $10 Platinum in MS70, which climbed to $1,000, up 33.33% as well. The majority of other coins in the top ten are rare Gold with the 1863 $20 Liberty in AU50 up 42.58%, now at $7,450 Market. 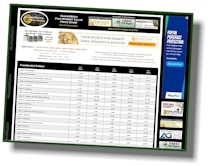 This week’s Moderns Wholesale Market Dealer Price Guide shows numerous changes in the Early Proof Lincoln Cent chart. This is an area where buyers are very selective, looking for nice coins without streaks. For Red & Brown or Red coins, buyers do not want spots, especially for the coins that grade above PR62. This week the 1912 RB in PR65 and PR66 are higher at $1,525 and $2,400, respectively. The 1913 in PR66 RB is also advancing to $1,850. Make sure to check the Modern Bullion charts because the metals fluctuated considerably over the last few weeks since the last printed price guide.